Does anyone here have any insight into "Intended Use", "Other Attributes" and "Subject Matter" fields in the "Edit Product" Page as it/they relate/relates to ranking for specific keywords and showing up higher or lower in search results for specific keywords? The "Intended Use" section is asking what the product is meant to be used for. For example, if you were selling Gatorade, the intended use would be for playing sports, running, hiking, and rehydration. The "Other Attributes" section is asking for extra information about the product. Again using Gatorade as an example, the other attributes would be: great flavor, convenient size, or any other relevant info about the product. 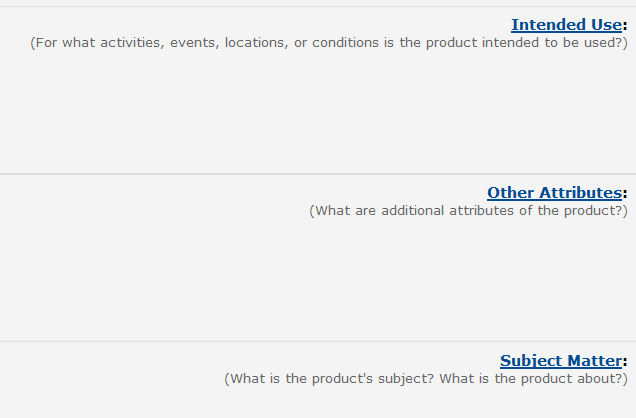 The "Subject Matter" section is asking what the product is about. Again, using Gatorade, the subject matter would be something about hydration, rehydration, sports, outdoor activities, active lifestyle or something along those lines.